Rangers can take a step closer to sealing a place in the Europa League knockout stages if they beat Spartak Moscow at Ibrox on Thursday night. Here the main talking points ahead of the game are examined. Walter Smith’s treble-winning side of 1992-93 set a club record of 10 games unbeaten in European competition when they came within a whisker of qualifying for the inaugural Champions League final. But Steven Gerrard’s crop can surpass that tally if they avoid defeat against the Russians. It may not have been racked up against the same calibre of opposition as Smith’s squad but for a side pieced together during the summer by a rookie boss, it would represent an impressive achievement for Gerrard and his team. Gers’ Colombian hitman Alfredo Morelos looks a different player to the one who trudged his way through the final few weeks of last term. If January rumours of a potential £9million move to China turned his head, a horror miss in the 3-2 defeat to Celtic two months later had him burying it in his hands. But Gerrard’s arrival has sparked a new lease of life and the 22-year-old is taking advantage. His strike against Hamilton was his 12th of the season and he has now played a part in nine of the last 10 goals the Light Blues have scored. If he plays well against against Spartak, Rangers have a chance. The Ibrox men were somewhat fortunate to end their eight month wait for an away win against Hamilton on Saturday. It took three late goals to see off Accies but the final 4-1 scoreline flattered the visitors at the Hope Stadium following a slack display. However, there should be no half measures on Thursday as the Russians check in to Glasgow south side. The old ground was bouncing for Rapid Vienna’s visit earlier this month and the atmosphere alone should ensure Rangers are on it from the start. Midfielder Ryan Jack is in line to make his first start since straining a calf on Scotland duty and his return is a timely boost with Scott Arfield ruled out with a hamstring injury. 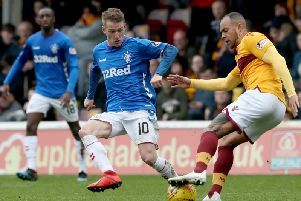 Borna Barisic is also a doubt with a muscle injury but the real selection dilemma for Gerrard is whether he sticks with Nikola Katic - who he replaced during Sunday’s win at Accies - after a less than convincing display or goes with Joe Worrall after his impressive showings in Rangers’ first two Group G fixtures.